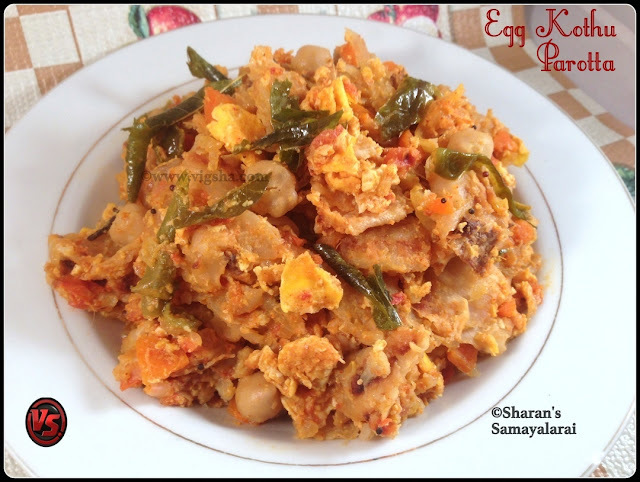 Egg Kothu Parotta is a famous lip-smacking street-food from South-Indian Cuisine. Kothu Parotta is nothing but minced or beaten-up parotta. In street shops, they usually use sharp spatula to prepare this dish. 1). Prepare parotta and chop or shred into small pieces, keep aside. You can also tear into pieces using hand. Finely chop onions and tomatoes separately, keep aside. 2). Heat oil in a pan, saute cinnamon, cloves and fennel, till aromatic. Then add green chillies, curry leaves, onions and salt, saute till onions turn translucent. 3). Add ginger garlic paste and saute till the raw smell leaves and onions turn golden brown. Then add chopped tomatoes and saute till it becomes mushy. 4). Add turmeric powder, chilli powder, pepper powder and eggs. Scramble the eggs to medium size pieces. 5). Add veg salna to the mixture and mix. Then add the shredded parotta pieces and combine. In a high flame, toss the parottas so that the masala is fully coated. Check for salt and spices and switch off ! Garnish with coriander leaves and drizzle few drops of lemon juice on top. Serve hot with raw onion rings! Enjoy this delectable street food !! # You can use home-made or store bought ready made parottas. I have used store bought parottas, available at Indian stores in the freezer section. # I have used veg salna which I had it handy. You can use any salna variety. You can even include leftover chicken or mutton gravy for extra flavor. # If you skip salna, the dish will be very dry. 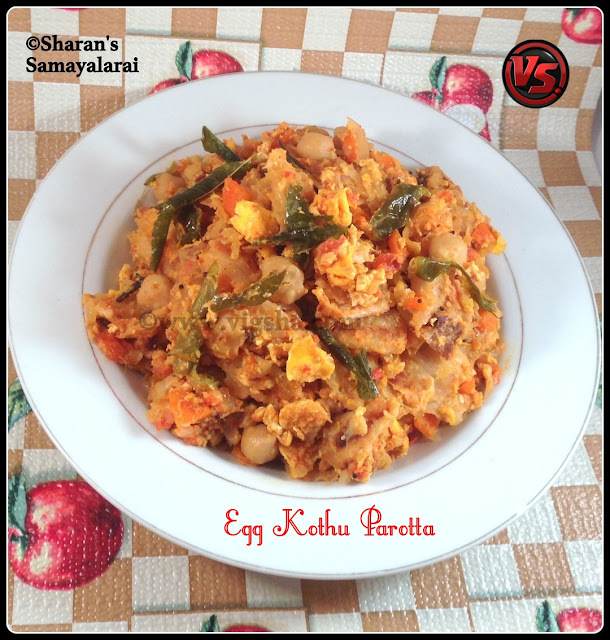 # For Veg version - skip eggs, use vegetables of your choice and follow the procedure. # Adjust the spice levels based on the salna or gravy you use. As the gravy itself will have masala. # Don't miss the garnishing part, coriander leaves, lemon juice and onions. It definitely adds a punch to the dish.